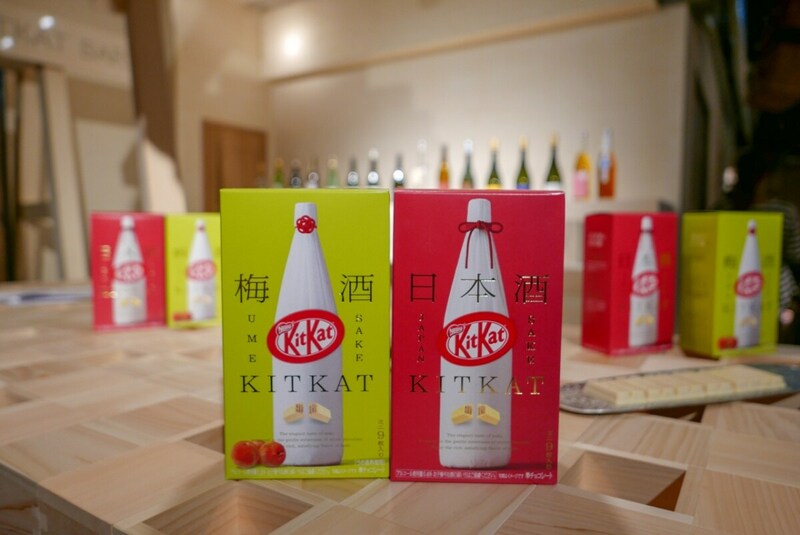 Nestlé Japan is releasing another sake-based Kit Kat to their range! This time the featured flavor is umeshu, traditional Japanese plum liqueur. This follows up on the huge success of their previous premium sake Kit Kat release. For their umeshu-based Kit Kat, the company brought back Japanese soccer star Hidetoshi Nakata, who was the spokesman for the premium sake Kit Kat flavor. Wakayama-based Heiwa Shuzou is providing the sake-based plum-flavored alcohol. In the photo above, Japan Sake Kit Kat sits on the right and the new release, the Ume Sake Kit Kat, officially called “Umeshu Tsuru-Ume Kit Kat," is on the left. 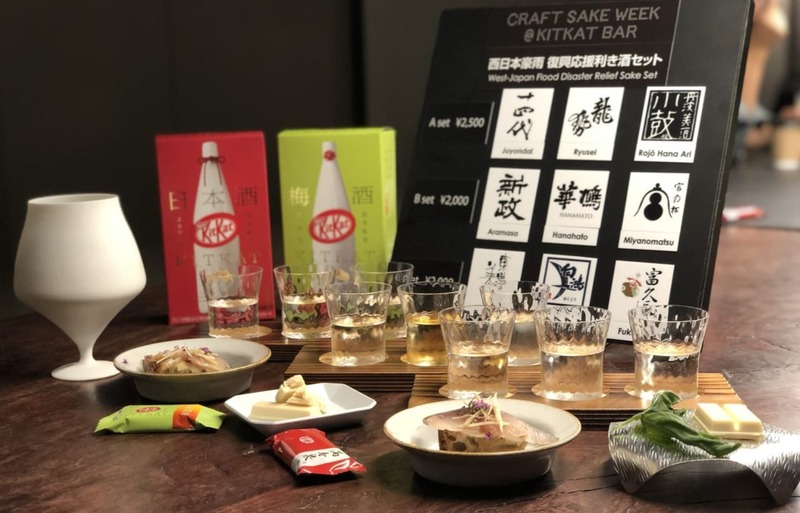 The new Ume Sake Kit Kats are scheduled to be released nationwide from September 18, 2018, but for a limited time you can get your hands on one at a special pop-up bar called Craft Sake Week @Kit Kat Bar. Located at CITAN, a café-bar-hostel in Tokyo’s Nihonbashi neighborhood, the pop-up bar has a host of impressive features to honor the new Kit Kat and its star alcoholic ingredient. And overseeing everything in the space is former soccer superstar Nakata, who’s now a sake superstar, using his wealth of experience with over 350 local sake breweries to help design products that promote the beauty of Japanese rice wine throughout Japan and the rest of the world. Nakata (left) has been working together with Heiwa Shuzou’s CEO, Fumio Yamamoto, (right) to select the brewery’s best plum sake for the new Kit Kat. First up, there are a limited number of beautiful Milano sake glasses on sale, which have been produced by esteemed ceramicist Kyousuke Hayashi in collaboration with Nakata, using a design that enhances the taste and fragrance of sake while conveying the beauty of traditional Japanese crafts. There’s also a gorgeous sake-tasting area, where customers can enjoy a selection of four kinds of umeshu and 12 different sake from around Japan, all chosen by Nakata, with a different brewery representative on hand each day to help you with your selection. The space also has a kitchen area, which serves up a number of delicious meals. But for this pop-up bar experience they’re serving an insanely delicious Cured Mackerel and Tofu Sour Cream Tartine for ¥500 (US$4.46). This menu item has been created exclusively for the Kit Kat pop-up bar by Shinobu Namae, Executive Chef at Tokyo’s L’Effervescence, a French restaurant which has been awarded two Michelin stars every year since 2015. In fact, everything at the limited-time Craft Sake Week @Kit Kat Bar has been meticulously chosen and lovingly created, with a focus on quality and high-end Japanese flourishes. From the specially selected sake to the carefully thought-out cocktails and the sourdough sushi from a two-star Michellin restaurant, it’s definitely worth stopping by for a visit—especially given that you won’t be able to try these special offerings anywhere else. The Craft Sake Week @Kit Kat Bar runs until September 24, 2018, while the new Ume Sake Kit Kats go on sale around the country from September 18, sold in a nine-pack box that retails for ¥700. For the address of @Kit Kat Bar and to see more of the tantalizing food, sparkling sake and sweet Kit Kat bars, be sure to click on the full story from SoraNews24 below!